A saving grace has been having my in-laws close by, allowing us to use their kitchen, washing machine and dish washer, so it was only fitting to return the favour with a meal. I chose something simple to prepare, seemingly, pork chow mein, which is a fair staple on Chinese take-out menu’s, yet still not something I had attempted to make cook myself. The dish called for water chestnuts, which were a new ingredient to me. They were fairly easy to find and a bit of a marvel actually, they look like chesnuts, but taste nothing like them. The only downside to this recipe were the noodles, only because I purchased quick boiling ones. Having not read the recipe ahead of time caused me to over cook them as the ‘add the broccoli florets to the noodles for the last 3 minutes of cooking’ step appeared several steps after I had already added them to the boiling water and my noodles were only 3 minute ones, DOH! They ended up being a little stogy, which is never fun. 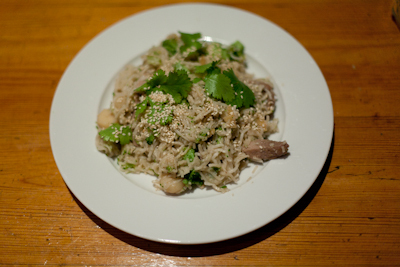 Overall certainly 20 minute worthy and a dish I’d cook again, correcting my noodle misdemeanor in the process.